Pretty Pink Posh "matching game"! Hi! I'm here today helping to announce that there are some fabulous things coming up for Pretty Pink Posh and I'm so happy to be a part of them! Today we are welcoming THREE new designers to the team. To celebrate, Paulina is having a little "matching" game. 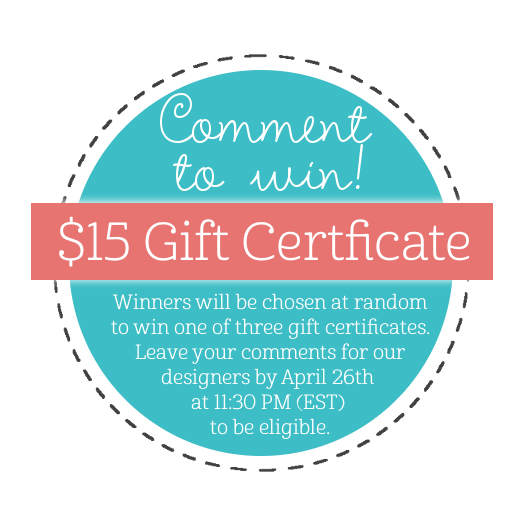 One person who guesses all the correct designers to their cards wins a $50 gift certificate!! Make sure to stop over at the Pretty Pink Posh blog to get your answers in!!! Hi! 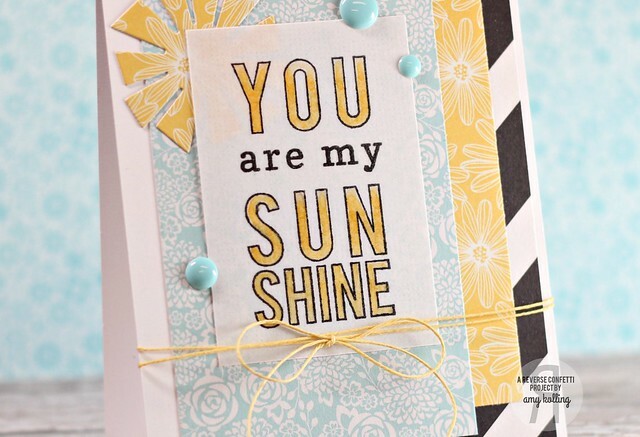 Since the weather is becoming more "spring-like" here and temperatures almost normal for this time of year, it's time to start sharing some cards that are happy! 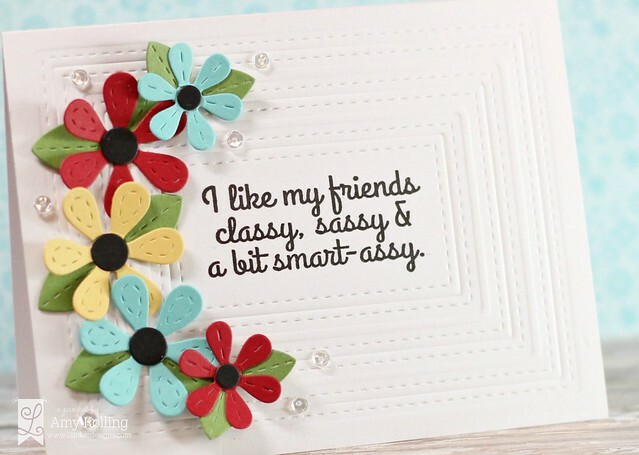 I shared this card up on the Taylored Expressions Blog last week........it uses all diecuts. There are so many Taylored Expressions dies that are "stand alone" dies and perfect for creating your own "scene" like this one! You can find the whole line of Taylored Expressions dies HERE. I had fun with layering of some gorgeous pattern papers from Jen Hadfield's Home+Made collection. I seriously think these are my favorite right now. They are fun and bold!!! Using this month's SFYTT from Reverse Confetti, these papers worked perfectly! I stamped my sentiment from Dream in Color onto some thick almost opaque vellum and colored the letters with my Copics. 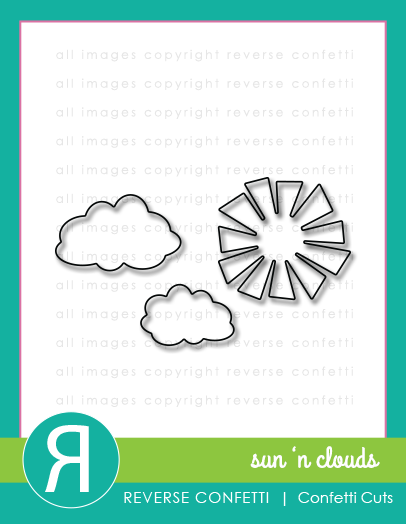 I kept true to the sketch except I added in a diecut sun from Sun 'n Clouds Confetti Cuts. Falling for You Release Blog Hop! 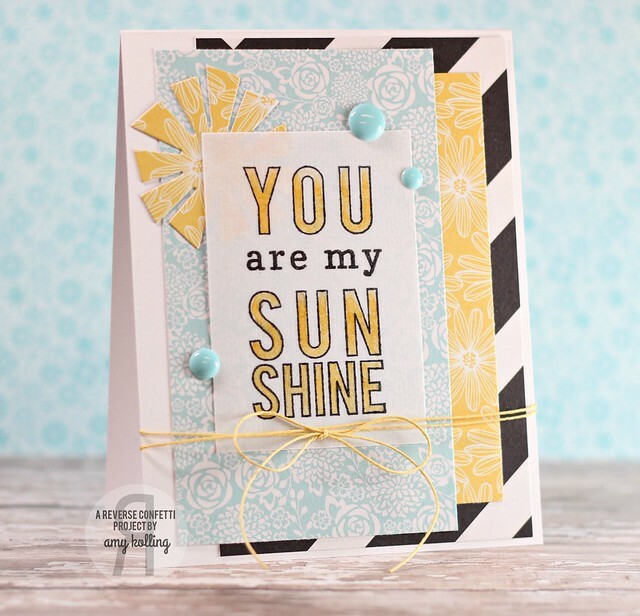 I'm so excited and honored to share in the fun again with the newest release for Simon Says Stamp called Falling for You for their largest blog hop ever! 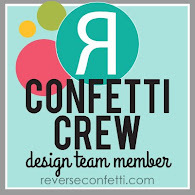 A MEGA blog hop! You should have arrived from the sweet Paulina Nakamura! So many cute goodies for this release! Check them out HERE. I have 2 cards to share today and then I'll let you get moving along the next stop which is Penny Ward. 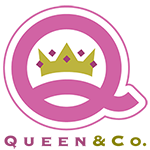 All the products are linked in the thumbnails below. 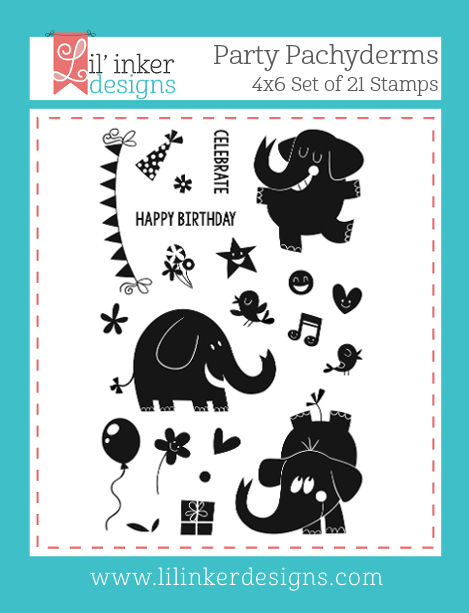 My first card is using this ADORABLE Baby Party Animals stamp set. How can this set get any cuter??? I started out by diecutting a panel with Frames dies from Simon Says Stamp using white and Khaki cardstock. To my white panel, I stamped the new background cling stamp Falling Stars with Seaglass Ink and then again using Versamark. Then using some WOW Silver Pearl Embossing Powder, I heat set the stars to give them some sheen. I then diecut the rounded square from Lunch Box Notes in the center of my star panel. I white heat embossed the word "BABY" inside the rounded square and stamped some hearts below. I added this cute cute Copic colored monkey with foam adhesive and have him holding the "welcome" banner! If you follow me over on Instagram, then you may have seen a teeny tiny sneak of this next card. I went with all rainbow colors! This uses the new Circle Dots Stencil. Here, I taped my stencil over a trimmed white panel and sponged Schoolhouse Red, Orange Peel, Sunshine, Green Apple, Island Blue, and Lavender inks from Simon Says Stamp over the stencil masking off sections as needed. 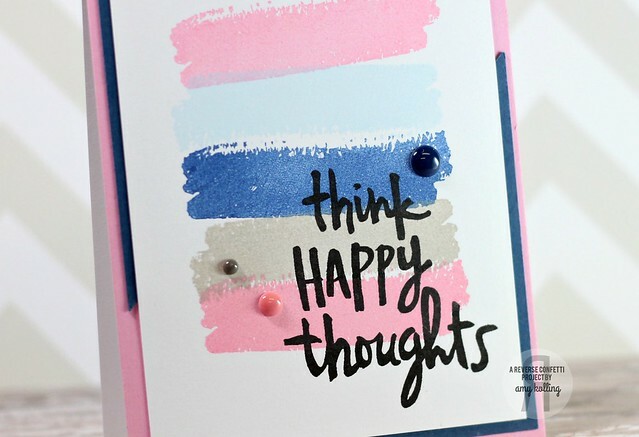 I stamped the circular sentiment, Sending Happy Thoughts, from the new Circle Sayings stamp set inside and outside some of the rainbow dots. This panel was added to my Island Blue Cardstock panel with foam adhesive. 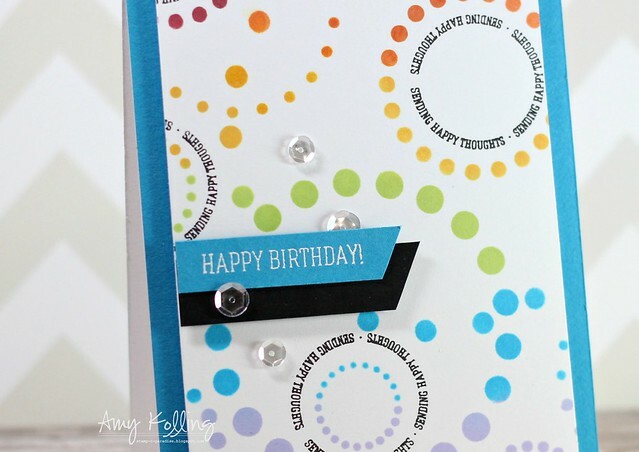 A "Happy Birthday" sentiment from Circle Sayings was white heat embossed onto a strip of Island Blue cardstock, trimmed at an angle, and layered with a black banner. A few Sparkling Clear sequins from Pretty Pink Posh were added for shine! Now onto the rest of the MEGA hop.........ya know, because there are prizes at EVERY STOP! Your next stop is over to the talented Penny Ward! Each stop on the hop will receive a Simon Says Stamp Prize pack randomly selected by Simon on April 28!!!!! I am sharing a card inspired by the colors in a shirt I saw the other day while out shopping. Remember, inspiration can be ANYWHERE! 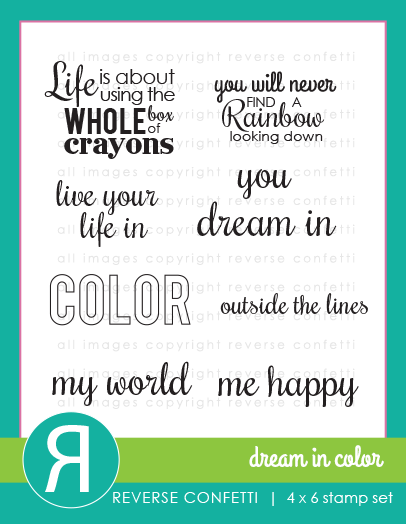 I used one of the brush stroke stamps from Color Me Happy from Reverse Confetti that was released this month. I wanted my sentiment to be BOLD so I stamped it in black Versafine. You get a crisp and clear stamp every time with this ink! 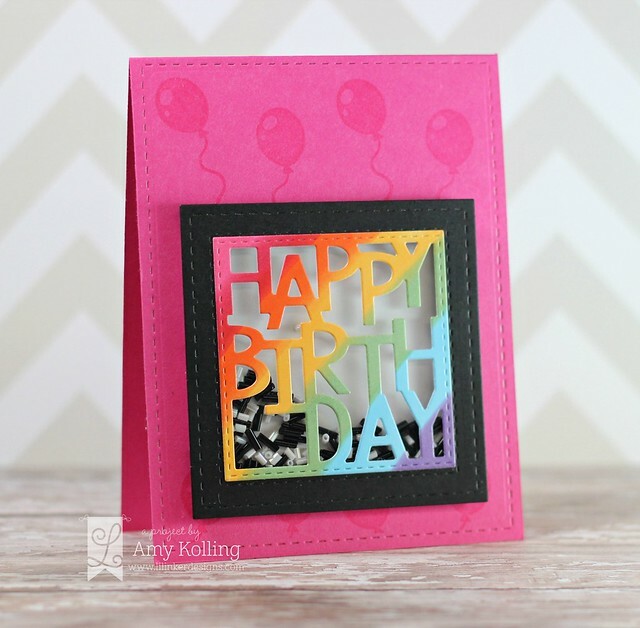 My stamped panel was layered over a scrap of cardstock I had that I cut into triangles. Kind fun for a different look! 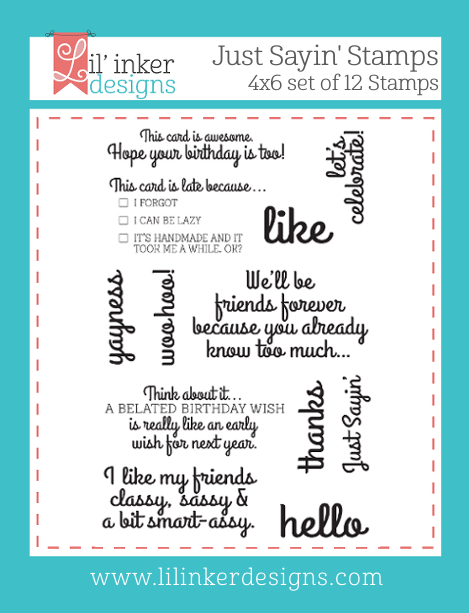 Welcome to Day 3 of the Lil' Inker Designs April Release! 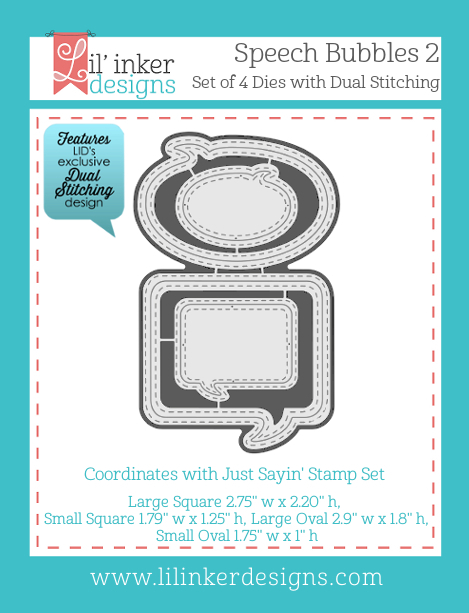 This release is FULL of amazing dies and stamps that will be perfect for those any occasion cards.......Have you checked out the new release yet???? You should have arrived from the Karen's blog. The whole new release is now available and can be found HERE!!! I've been busy 'SHAKIN things up in my studio..........I have 2 shaker cards to share and a fun "girly" card! So hang in there with me........this post is a bit long! My first shaker card uses this awesome new Party Pachyderms set. 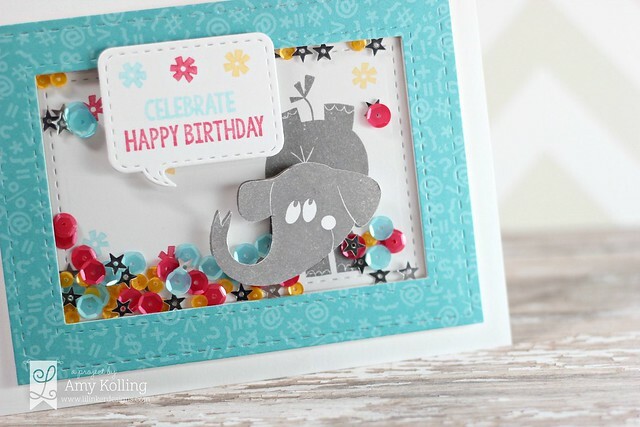 I love the elephant trend with stamps lately and this one does not disappoint! This set has 3 elephants that are SOLID. For those of you n0n-colorers out there.....this one is for you! 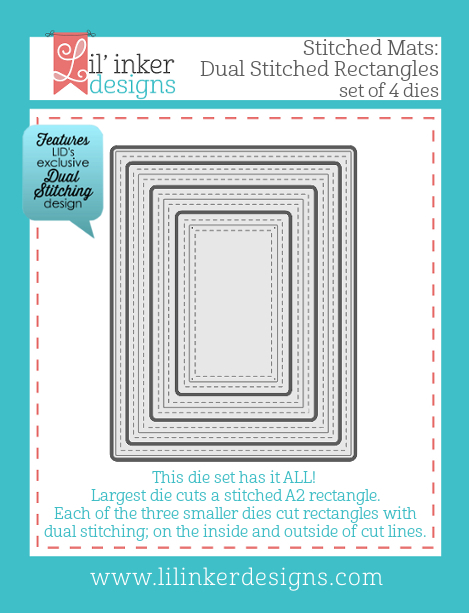 I've also used several other NEW die sets for this.......Stitched Mats: Dual Stitched Rectangles and Speech Bubbles 2. 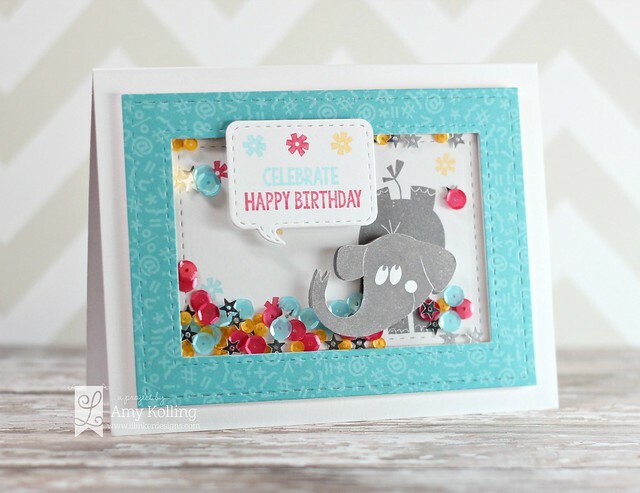 One design note......I wanted my pachyderm to really stand out so I stamped it inside the shaker and then again on scratch cardstock cutting only the head out. I mounted this and the speech bubble on top of the clear cardstock. My shaker was filled with Watermelon, Aquamarine, Marigold, and Mini Star Sequins (from Pretty Pink Posh). 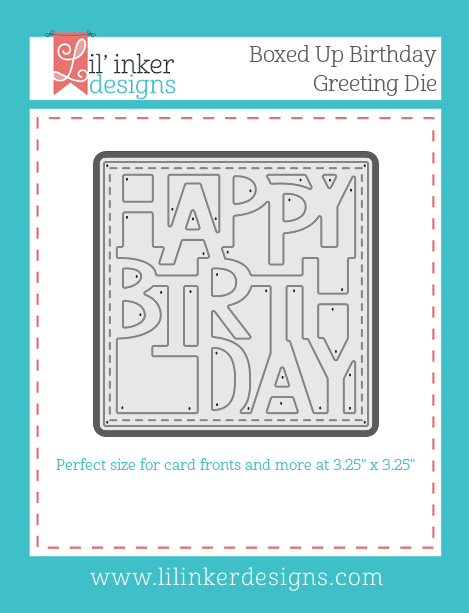 My second shaker card uses the Boxed Up Birthday Greeting die. 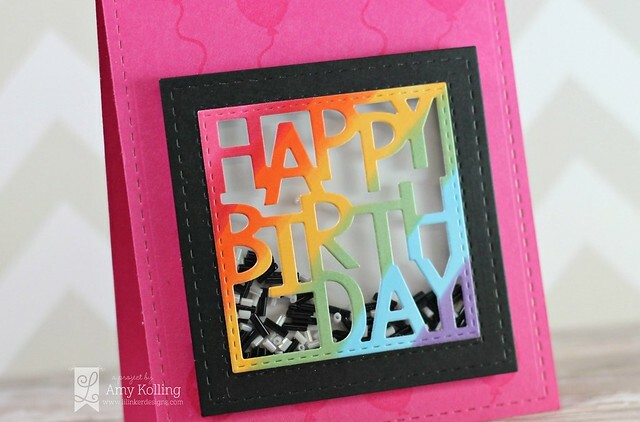 To create my rainbow greeting, I blended in a number of Copics at an angle and diecut my greeting. The frame was made using the Stitched Mats: Dual Stitched Squares. 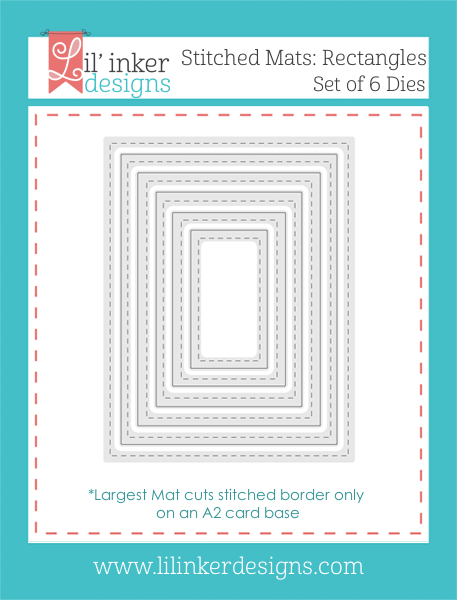 I also used the original Stitched Mats: Rectangles for the stitched border around the perimeter of my card. The balloon image (from Party Pachyderms) was stamped in Versamark. Now since I decided to use some beads vs sequins for my shaker, I doubled up on the foam adhesive so that the beads would have room to shake shake shake! 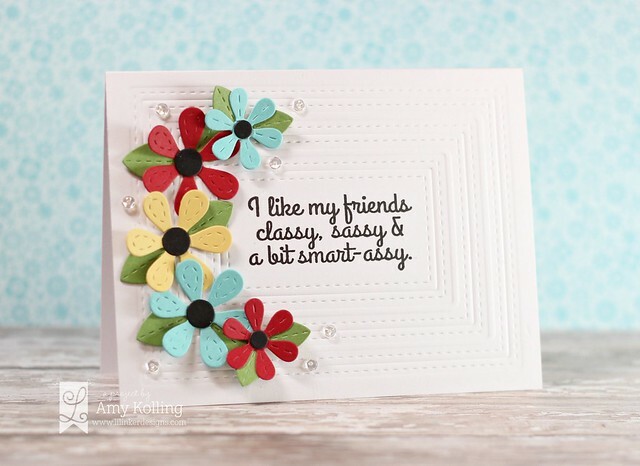 My final card uses the AWESOME new Perky Posies die set! 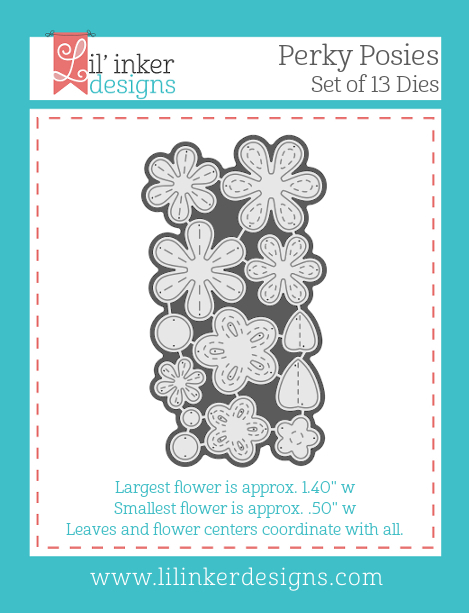 Oh how I've waited for a stitched floral set from Lil' Inker Designs!!! Thank you Laura!!! I just love how some have straight stitches and some with curved details! Ok......I wanted to talk some about all the dry embossed framing used here. 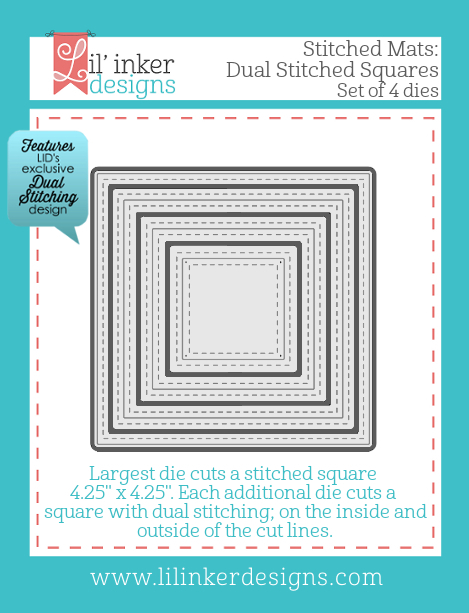 I've used the new Stitched Mats: Dual Stitched Rectangles (3 smallest sizes). I simply lined them all up on my cardfront and taped them down with painters tape. I ran this through my Big Shot using 2 embossing mats. I love the results! (This is just another reason you NEED this new die set even if you have the original!) Now, I must mention that sentiment......so bold! It is from the new stamp set called Just Sayin'. 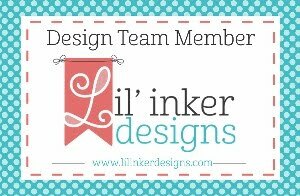 Lil' Inker Designs April Monthly Meetup!